As Meatball the bear gets his own float in the parade, we present a few moments from 2013 that are float-worthy. For the 125th edition of the Rose Parade, held on New Year’s Day, a special visitor will make an appearance and he’ll sitting atop a float moving slowly down the streets of Pasadena. It’s Meatball the Bear (yeah, he has his own Twitter feed and it’s the subject of a nasty legal dispute). Don’t remember Meatball? He’s the black bear who made news by moseying into the Glendale area and stopping to snack on frozen meatballs he found in a resident’s garage. Though he also ate some rice and baklava, the name Meatball stuck. His junk food addiction eventually led to his apprehension when authorities from the California Department of Fish & Wildlife lured him with McDonald’s french fries. These days, Meatball resides at an animal sanctuary near San Diego but his antics have made him a legend. 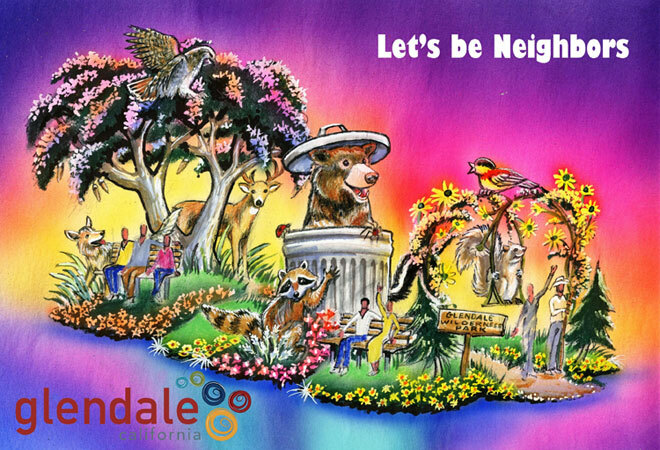 The city of Glendale even decided to honor him by featuring him on their Rose Parade float, a $150,000, 18-feet wide, 25-feet tall creation that features an animatronic version of Meatball popping up from a garbage can. For the ursine set, that’s like a multi-course meal at the Bazaar by José Andrés. A float built in your honor is arguably the highest form of praise in Southern California, which made us ask: What other events deserve this honor? Here are a few nominations for the 2013 trends that should floats in the Rose Parade. Inspiration: The word “selfie” made its way into the dictionary this year, but the act of snapping one at a funeral that turned a memorial into meme. Design: Two teens hold an iPhone in front of their faces; every time the camera flashes, a casket creaks open behind them, and an elderly man emerges while shaking his fist. Inspiration: During MTV’s Video Music Awards, Miley Cyrus attempted to perform a dance move that originated in hip-hop videos, strip clubs, and middle school dances. Design: This depiction of the evolutionary history of the twerk features 25-foot-tall animatronic booty shakers starting with New Orleans bounce queen Big Freedia, leading to local stars the L.A. Bakers, and ending with Miley Cyrus, who represents the death of the booty clap. Inspiration: The internet went crazy when L.A. barista Brody Ryan sent a woman a cheesy video message of himself throwing seductive looks while Drake’s “Hold On, We’re Going Home” played in the background. Design: An oversized animatronic barista leans toward parade attendees, hovers above them, coyly smiles, and dangles his simian-like phalanges perilously close to their heads. ✒ Want to see the real Rose Parade floats up close? You can view them on January 1st and 2nd. Details here.